This time I get to teach. I enjoy being a student, learning new things, and new ways of doing things. I also love to teach. It is a wonderful opportunity to come alongside a learner, to lead someone to see what they can achieve, to open up a door to fresh possibilities. This week I am in the teacher role. I’m eager to get to know the students and see the double binding rag rugs they will create as a result of our focused time together. And I am looking forward to learning what the students will teach me! 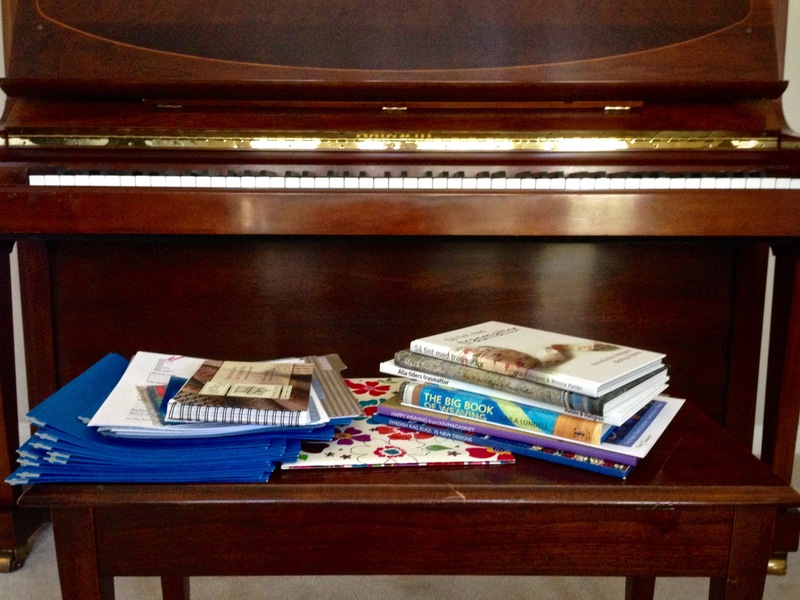 Compiling notes and assembling folders takes place in my office, which is in my music studio. 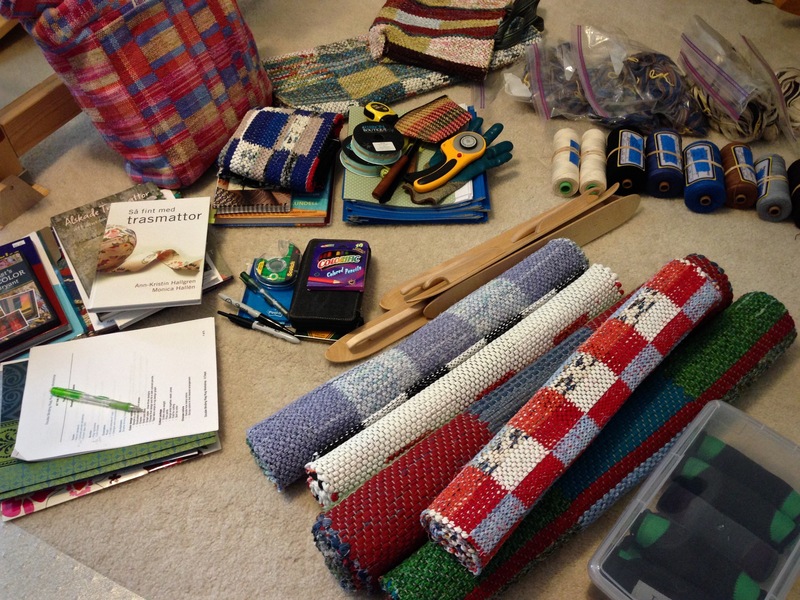 With my checklist in hand, I make little piles of supplies, tools, and examples in my weaving room. Workshop supplies are stacked in plastic bins. The big duffle bags holds example double binding rugs. 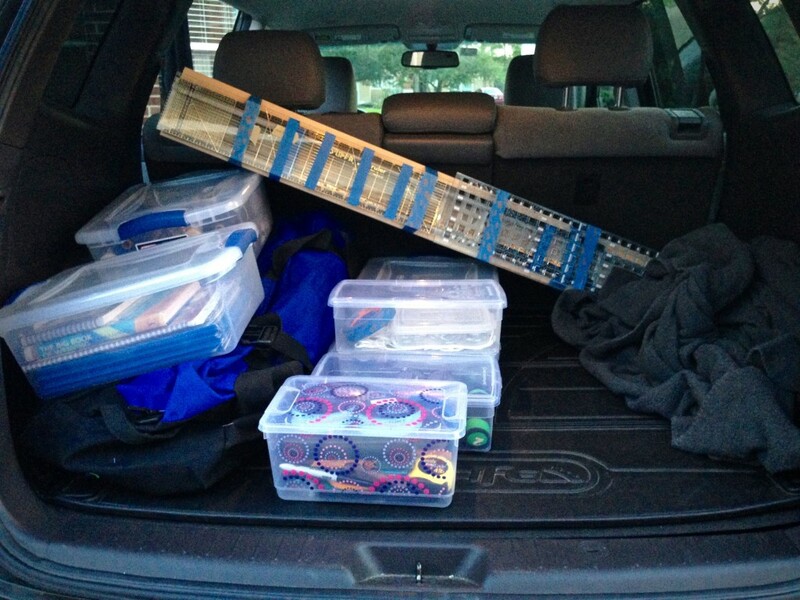 Car is packed while there is still daylight. Road trip begins very early the next morning. May you teach what someone else wants to learn. I would love to partake in your class! 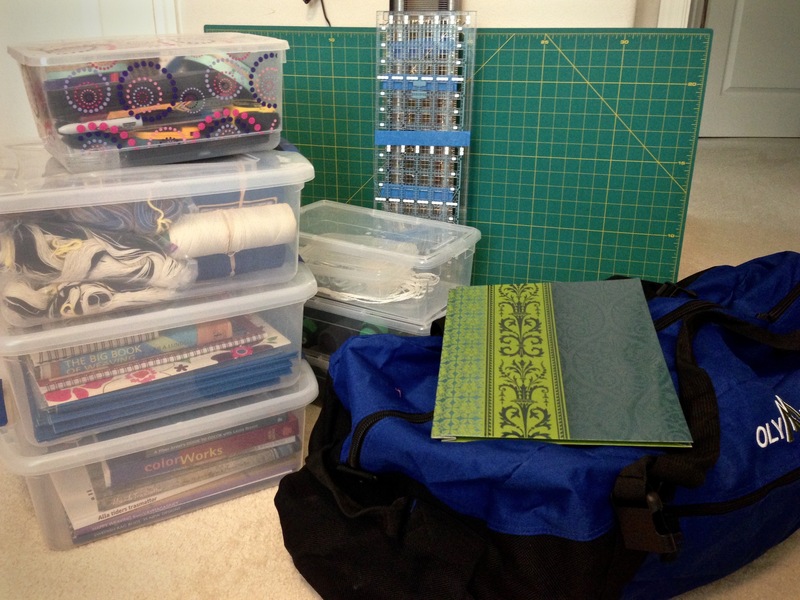 Even a photo of your supplies and favourite books inspires me …. a picture is worth a thousand words! Look forward to reading about the fun and creativity that comes from this class. Wish I could have made it down to Red Scottie Fibers to partake in your class. Enjoy the class! Hi, Martha, I may be back to Red Scottie Fibers. Maybe I’ll see you then! Have fun teaching, I know you will do a great job! Can’t wait to hear all about it! Thank you Karen for the wonderful workshop! You are such a positive, warm and friendly person and such a knowledgeable instructor. Loved your class and the chance to meet you. Hope to take more workshops from you in the future. 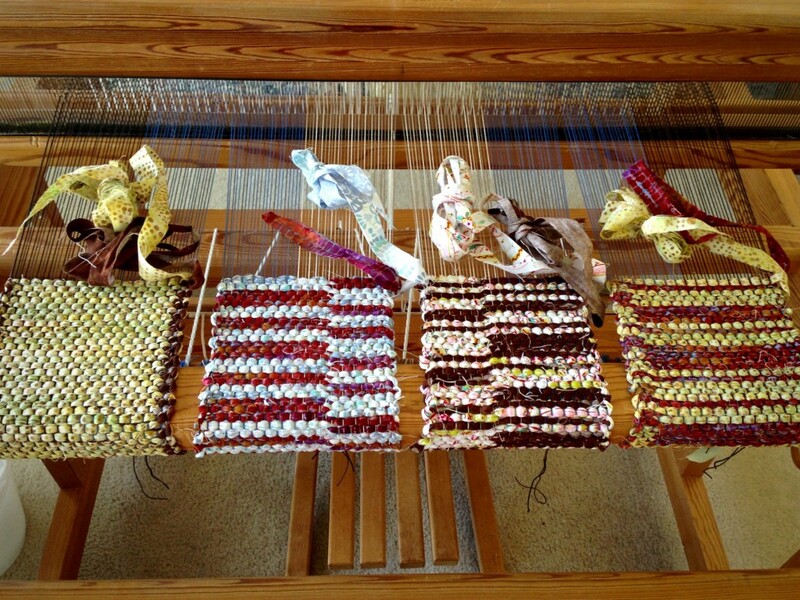 Double binding warp is divided into four sections to weave individual mini rag rugs. Draw-in happened gradually, and didn’t seem to pose a problem until near the end. Then warp ends started snapping. Mini rag rugs off the loom. After making all repairs and finishing the ends, they will be hemmed and ready for use as mug rugs and hot pads. Words reveal a person’s core. When abrasive thoughts continue time and again, words eventually break loose from the tongue. The warp end breaks, and the stability of the rug is compromised. It may seem like the warp end is the problem, but the problem is the abrasion that led up to the breakage. Fortunately, broken warp ends can be fixed, with time and effort. But learning to eliminate the abrasion in the first place is the tactic I want to employ. May you strengthen your core. Thank you for these thoughts; you’ve put into words so nicely what’s developing in my life. I appreciate your site. Hi, Shelly, it is great to have you along! 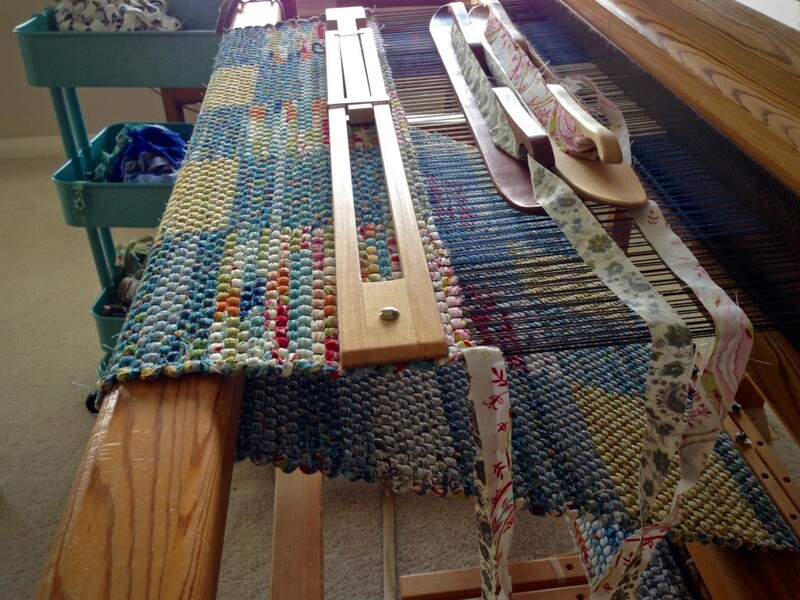 Does Your Weaving Show Your Very Own Style? Rag rug on the loom is almost complete. Moving the temple frequently helps produce tight selvedges, which, in turn, help ensure a finished rug that lays completely flat. Everything we see that is glorious is a window into the glory of God. Look through the window. The whole earth is filled with the glory of God. If our small artistic attempts are reflected in what we make, is it inconceivable that the wonders in our universe have the Creator’s signature? Everything glorious puts the Grand Weaver’s personal touch on display. May you find your personal style. 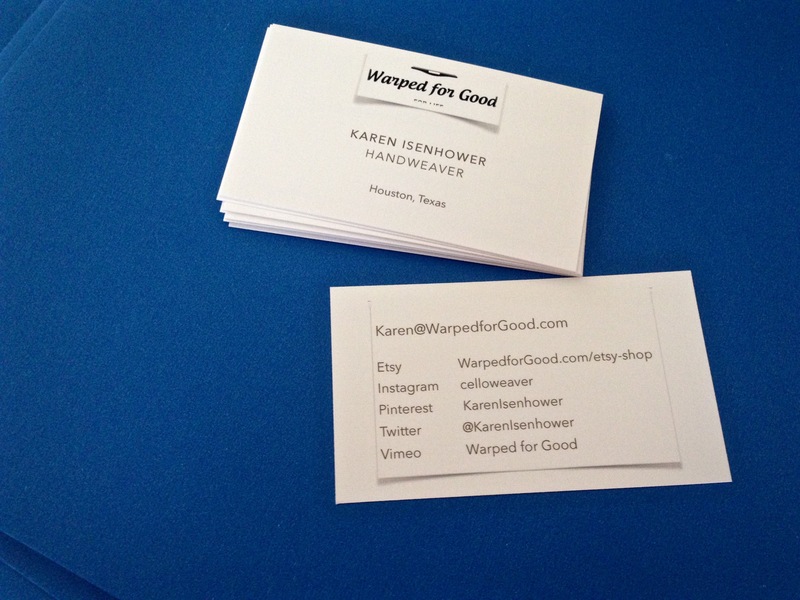 Karen, Thanks for your thoughtful words. It was a most welcome reminder. Life is so fragile and we are here for such a short time. Let’s rejoice in the creativity we are given. Nancy, Very well said! Let’s make the most of what we’ve been given. Do people know how much fun it is to weave rag rugs? Next week I’ll be in Arkansas teaching what I love. This ten-yard warp is giving me ample rehearsal time for explaining double binding techniques. 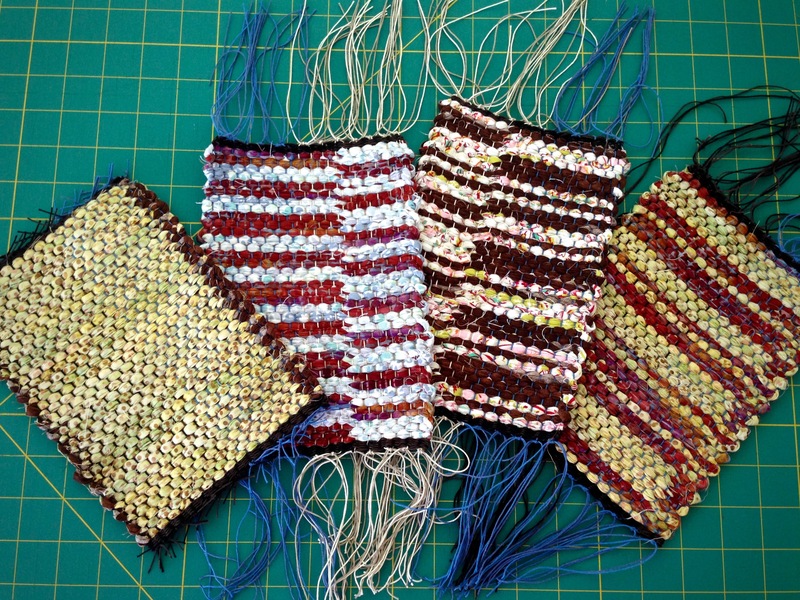 Mostly, though, I want to introduce students to the thrill of rag rug weaving! Double binding uses two ski shuttles, because the structure has two layers woven together. Each side of the rag rug is the reverse of the other side. I am puzzled by weavers who are not fond of weaving rag rugs. “It’s too slow,” I’ve been told. 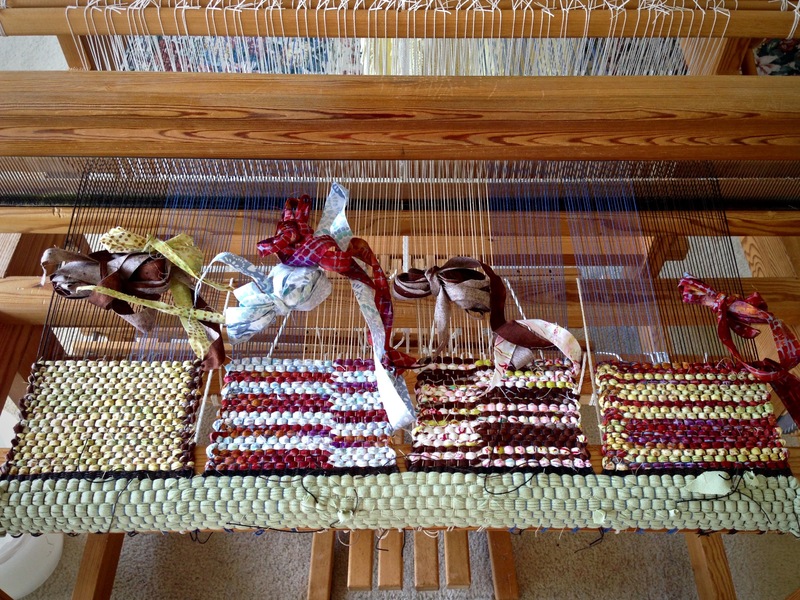 “It doesn’t interest me.” And what about weavers who have never attempted to weave a rag rug? “What? !” I want to say, “You have a weaving loom, and you’ve never tried weaving a rag rug?” That tells you more about me than it does about them. People are drawn to what they know and love, and they see that thing differently than someone who is not drawn to it. The goodness of God is like that for me. I’m drawn to it. God is good. One famous saying of Jesus is that the pure in heart will see God. That motivates me to examine my own heart. I can’t think of anything better than seeing the goodness of God. May you be drawn to good things. How exciting that you are TEACHING weaving, Karen. Your students will be blessed. And Eureka Springs is such a beautiful location. I so agree with your comment on nothing being better than seeing the goodness of God. Amen! Hi, Bev! It’s good to hear from you. Yes, Eureka Springs is the perfect setting for a weaving class. These students will be my blessing. 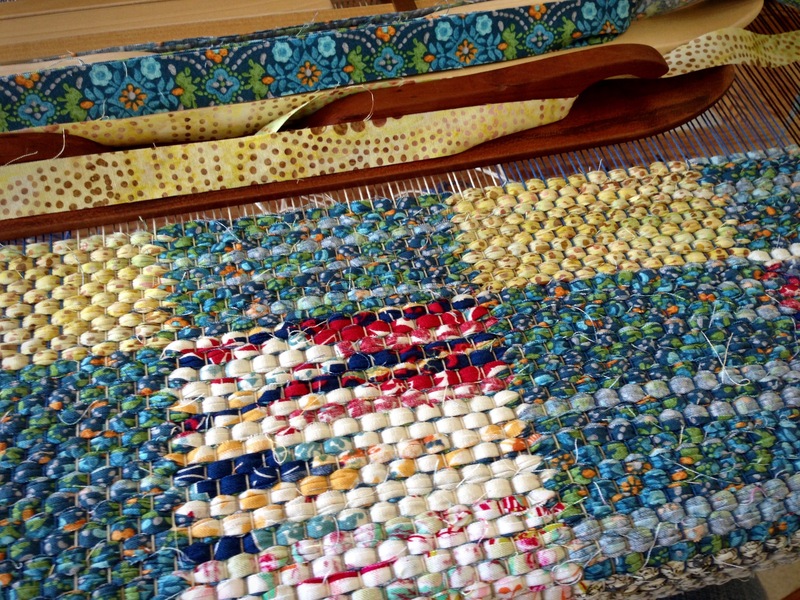 I’m weaving my first rag rug right now – a simple plainweave from Tom Knisely’s book. I did warm up with a few placemats, but this is the first rug. I look forward to trying a doublebinding rug one of these days! I enjoy your posts – good luck teaching! I will be in your eureka class on Monday. I am so excited. Can’t wait to meet you. Does your mind wander for repetitive tasks? Each of 780 threads must pass through the small eye of a heddle–the correct heddle–to create the cloth that I have in mind. Threading 8/2 cotton in a straight draw, 1-2-3-4, is easy enough that I do it almost without thinking. Precision at this stage, however, is critical. 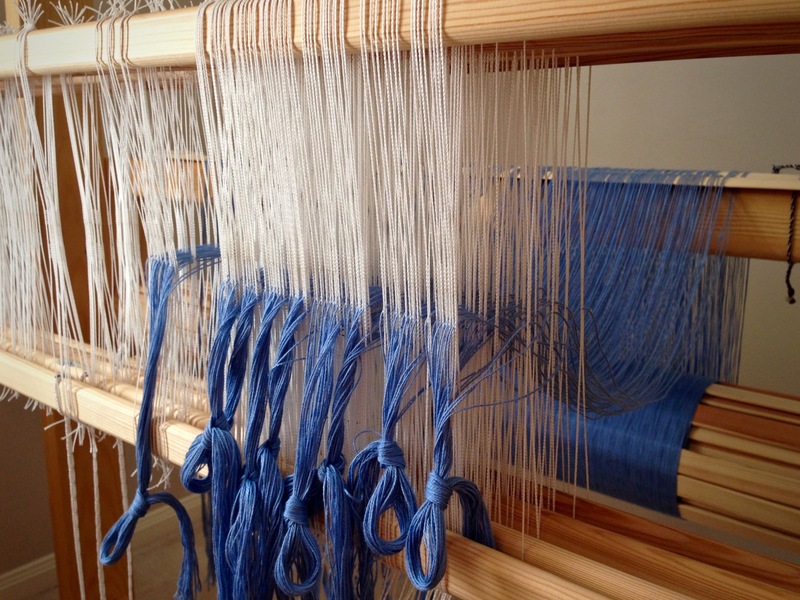 Each section of 32 threads is tied into an overhand knot after the threading has been double checked for accuracy. Like a thread going through the eye of the correct heddle, I want each of my thoughts to go through the door of truth. Truth is the key to a purposeful life. We get trapped by faulty thinking, but truth brings us to our senses and unlocks the trap. Bringing cohesiveness and clarity to all aspects of life, truth enables us to see the cloth that is being woven. Isn’t it time to stop and double check the threads of our thinking to make sure each thread is going right through the eye of the heddle? May you fulfill your purpose.